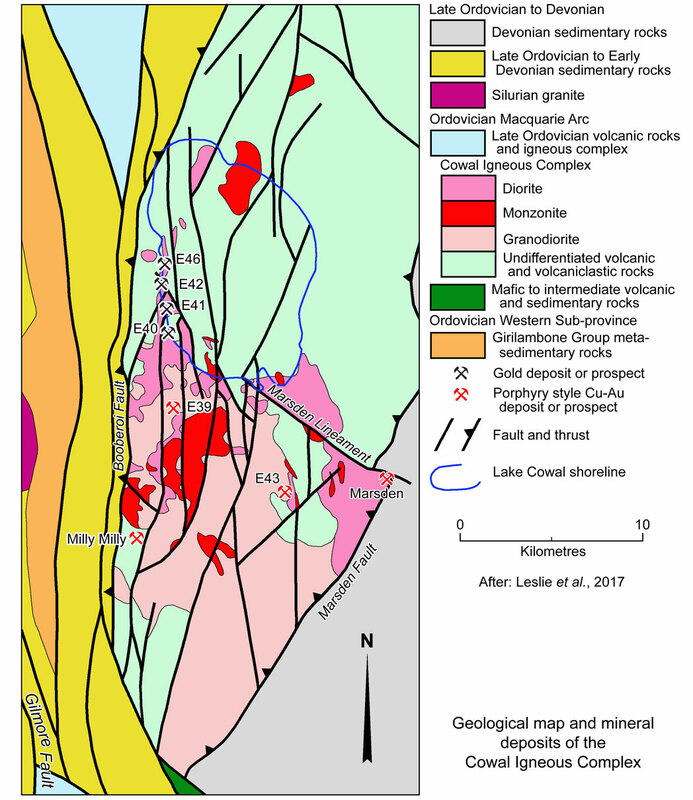 The Cowal gold operation, which exploits a cluster of structurally controlled, low to intermediate sulphidation epithermal, quartz-carbonate-base metal-gold deposits is located on the western edge of Lake Cowal, ~350 km west of Sydney and ~35 km NNE of West Wyalong in central New South Wales, Australia. The main deposit, which contains the bulk of the known resource, is Endeavour 42 (E42) (#Location: 33° 38' 12"S, 147° 24' 23"E). Five main deposits/mineralised blocks have been delineated, spaced at ~1 km intervals within the 7.5 x 2 km, north-south oriented 'Gold Corridor' at Cowal (Henry, McInnes and Tosdall, 2014; Balind et al., 2017). These are, from south to north: E40 where sporadic gold mineralisation is intersected but no significant resource has been delineated; E41, comprising the high grade E41 West and East pods that are ~300 m apart; E42, the current Cowal open pit mine; Regal-Galway, a discontinuous line of steep, high grade lodes connecting the NE margin of E42 with E46 East; and E46, comprising the E46 West Pod and the steeply west-plunging E46 East body. Prior to 1980, historic prospecting and shallow gold mining activities, followed by modern exploration had taken place in areas of better outcrop to the west of the currently known Cowal deposits. No investigations have been conducted in the immediate area of Lake Cowal due to negligible outcrop and up to 80 m of lacustrine sediment and cyclical flooding. Following their success in discovering the Goonumbla (Northparkes) deposit ~100 km to the NE, Geopeko, the exploration arm of Peko Wallsend, identified the Lake Cowal area as having potential for porphyry copper mineralisation. Geopeko subsequently conducted shallow reconnaissance RAB drilling to bedrock over targets largely selected on the basis of geophysical data. 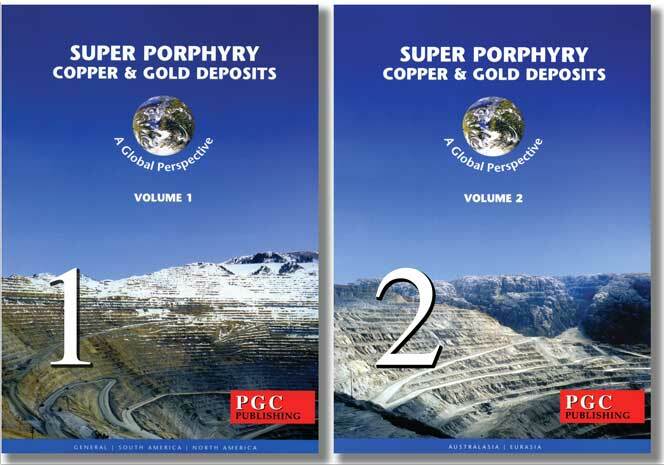 By 1988 when Peko Wallsend was acquired by North Limited, the geology of the Cowal Igneous Complex had been delineated and a number of low grade porphyry copper prospects identified to the south. In addition, an area of ~7.5 x 2 km of >0.1 ppm Au had been outlined along the western margin of Lake Cowal. During the early 1990s, North Ltd outlined the E 41 and E 42 deposits and by 1995 had completed a feasibility study for mining E42. In 2000, North Limited was acquired by Rio Tinto who on-sold the Cowal Project to Homestake Mining. Following a merger in 2001, Homestake was absorbed into Barrick Gold Corporation. Open pit mining commence at E42 in 2005 and processing commenced during the third-quarter on 2006. In 2015, Evolution Mining acquired Barrick Gold's 100% interest in the Cowal Gold operation. Drilling has continued to further evaluate E41 and the other satellite deposits of the Gold Corridor. The Cowal deposit lies within the Macquarie Arc of the Palaeozoic Lachlan Fold Belt of southeastern Australia. The Macquarie Arc is an Ordovician to Early Silurian intra-oceanic volcanic arc in central and southern New South Wales. It was accreted to coeval Ordovician sedimentary terranes to the west, but was subsequently dismembered during the Middle Silurian to Middle Devonian into several volcanic belts by predominantly east-west extension accompanied by sinistral, arc-parallel strike-slip displacement (Crawford et aI., 2007; Glen et aI., 2007, 2009; Fergusson, 2009). Cowal lies within the southern segment of the most westerly and longest of these belts, the >450 km long, sporadically exposed Junee-Narromine volcanic belt. The western margin of the Junee-Narromine Belt is marked by the Gilmore Fault of the NNW Gilmore trend in the SW, and by the north-south to NNE Tullamore Fault of the Tullamore trend in the central and northern sections (Glen et aI., 2007). A series of other large, subparallel ductile and brittle fault zones belonging to these two trends also cut and dislocate the belt internally and to the east. Deformation along these fault zones is complex, with reactivation as strike-slip, thrust and normal faults throughout the Palaeozoic (Glen et aI., 2007). The Gilmore and Tullamore trends converge in the southern exposed segment of the Junee-Narromine volcanic belt in the vicinity of the Cowal Igneous Complex (Glen et aI., 2007), host to the Cowal deposit and numerous other epithermal Au and porphyry Cu-Au prospects in the vicinity. Most volcanic and intrusive rocks of the Macquarie Arc exhibit low to medium K calc-alkalic chemistry, regarded as indicative of subduction-related melts (Crawford et aI., 2007). Locally these rocks have shoshonitic compositions, attributed to an intraoceanic arc setting and derivation of magma from sources enriched in light rare earth elements (Stern et aI., 1988; Wyborn, 1992). These shoshonitic rocks occur along the intersections of the volcanic belts with NW trending transverse/transfer structures, inferred to be major basement structures obliquely cutting the Macquarie Arc (Glen et aI., 2002). Gold mineralisation at Cowal is hosted by the ~475 to 460 Ma Ordovician Cowal Volcanic Complex that is exposed within a north-south elongated 40 x 15 km window, surrounded by unconformably overlying Siluro-Devonian sedimentary and volcanic rocks. It comprises a variable mixture of volcaniclastics, coherent extrusive rocks and high-K calc-alkaline to shoshonitic intrusive units (Glen et aI., 2002). The complex is bounded to the west by a broad, highly deformed north-south zone within the Siluro-Devonian sequence, the NNE Booberoi Thrust Zone of the Tullamore trend, whilst the eastern margin is defined by the parallel Marsden thrust. The complex lies along the western edge of the Eastern Subprovince of the Lachlan Orogen, at the southern end of the linear NNW trending Junee-Narromine Volcanic Belt, and is separated from the turbidite dominated Western Subprovince by the NNW-SSE trending Gilmore Fault Zone. The complex is reflected on aeromagnetic images as a 'finger print like', oval shaped magnetic high, one of 16 such igneous complexes in the district (Balind et al., 2017). The Cowal Volcanic Complex is dominated in its central and northern parts by north-south trending Early Ordovician andesitic to latitic volcanosedimentary successions that have been intruded by gabbro and diorite to syenite intrusive suites. In the south, it comprises large multiphase tonalite to granodiorite intrusions. The Cowal gold deposits are hosted by a subaqueous Ordovician succession of volcano-sedimentary rocks intruded by diorite to granodiorite stocks and numerous dykes (McInnes et aI., 1998; Crawford et aI., 2007). The volcano-sedimentary successions include fine grained mudstone and sandstone; volcanic sandstone, breccias, and conglomerates; lavas; and shallow-level dyikes and sills. The volcanosedimentary succession represents primary, resedimented and reworked volcanic rocks and sedimentary rocks with complex and rapid lateral and vertical facies changes, although the broad stratigraphy across the district is consistent and traceable (Henry et aI., 2014). In general, within the mineralised section of the Cowal Igneous Complex, the volcanosedimentary rocks dip shallowly to the northwest (Henry et aI., 2014). The lavas, dykes and shallow intrusions which are interbedded with or have intruded the volcanosedimentary and sedimentary succession are trachyandesitic to andesitic in composition and are variably feldsparphyric. Lavas and shallow intrusions generally have both coherent and autoclastic facies, including peperite and hyaloclastite. The autoclastics are monomictic with jigsaw fit textures, whilst hyaloclastite units are commonly reworked and resedimented. Dykes are generally <1 to 3 m thick with sharp contacts, commonly with fine grained chilled margins, and are interpreted to possibly represent feeders to sills and lavas higher in the stratigraphy (Henry et aI., 2014). Primary pyroclastic rocks are absent, although many polymictic volcaniclastic facies have abundant clasts of pyroclastic origin. The polymictic volcaniclastic facies all contain a mix of juvenile and nonjuvenile volcanic and sedimentary clasts, and are interpreted to have been deposited by cold, water supported, sedimentary gravity flows (K. Simpson, pers. commun., 2007 reported by Henry et al., 2014). These rocks, and the hyaloclastite, peperite, and laminated mudstone deposits suggest a subaqueous depositional setting for the Cowal district. This is consistent with the recognition of a fossiliferous limestone clast within a polymictic lithic breccia just to the north of the Cowal deposit. The dominance of graded and massive beds and the lack of shallow-water sedimentary structures in any of the clastic volcanic and sedimentary facies indicate deposition below storm wave base, whilst the laminated mudstone units reflect background pelagic sedimentation (Henry et al., 2014). The Cowal Volcanic Complex is bounded to the west by the multiply reactivated, NNE trending, 60°W dipping Booberoi Fault which separates the basal conglomerate of the Siluro-Devonian Ootha Group, Manna Conglomerate from the Ordovician rocks of the complex in its structural footwall. Fault rock sericite has yielded a 411±2 Ma age (40Ar/39Ar; Foster et al., 1999; Lyons, 2000), interpreted to be the minimum age of the youngest deformation on the Booberoi fault (Glen et al., 2007). The 15°W dipping and NNE trending Marsden thrust separates the complex from Devonian sandstone and marl to the east. The complex has poorly defined northern and southern margins where they are unconformably overlain by Devonian sedimentary rocks (Balind et al., 2017). On the basis of seismic profiling and structural analysis the complex has bee interpreted to have been developed over a large domal intrusive at depth with secondary flower structures, north-south faulting and crenulation folding near surface (Glen et aI., 2002). A series of north-south striking prominent arc parallel, and more subtle WNW to NE striking, principal structures have been delineate from aeromagnetic images. These structures have been interpreted to merge and form fault-bounded blocks behaving independantly during deformation. The aeromagnetic data reveals a greater intensity of north-south orientated faults on the western side of the complex. Two of these, the Reflector and Wild Turkey faults, define the eastern and western margins of the ‘Gold Corridor’. Other major parallel faults within the gold corridor (the ROM, Drambuie and Glenfiddich faults and Cowal shear zone) offset both the geology and mineralisation (Balind et al., 2017). Mapping and drill core logging indicate the north-south and WNW faults are intimately associated with gold mineralisation within the Gold Corridor. The interaction of the north-south faults and NW transfer structures is interpreted to reflect a transient change from east-west to NW-SE compression, facilitating sinistral strike-slip movement on the north-south faults, which in turn created significant normal fault style extension on NW-trending faults. Pre-, syn- and post-mineralisation structures are frequently intruded by basaltic to andesitic dykes (Balind et al., 2017). In addition to these semi-regional domain bounding structures and deposit scale, grade-controlling north, NW and NE trending faults, the Cowal Igneous Complex is also cut by a poorly defined WNW trending structure, the Marsden lineament, not to be confused with the NNE trending Marsden Thrust (Leslie et al., 2017). This structure broadly juxtaposes volcanic and sedimentary sequences and lesser diorite that host the structurally controlled Cowal epithermal systems to the north, with polyphase, dominantly equigranular granodiorite to monzonite hosts to porphyry systems in the south (Leslie et al., 2017). A number of calc-alkalic porphyry systems are distributed over an area of ~12 x 8 km within the intrusive suites south of this lineament. Outcrop is sparse in this area and targets tested were initially predominantly generated from airborne magnetic geophysical data. These include the Marsden porphyry deposit 16 km SE of E42 which has an indicated and inferred mineral resource of 180 Mt @ 0.38% Cu, 0.20 g/t Au (Leslie et al., 2017). The core of this deposit is characterised by quartz, magnetite, chalcopyrite stockwork veining cutting biotite-magnetite altered quartz monzonite to quartz diorite (Rush, 2013). Similarly, biotite-magnetite altered porphyritic diorite and intermediate to mafic volcanic and volcaniclastic rocks and lesser magmatic breccias, host local stockwork chalcopyrite mineralisation 5 km west of Marsden at the E43 porphyry target. Seven kilometres NE of E43 and 3 km south of E42, at E39, widespread low-grade copper mineralization (e.g., ~0.1 to 0.2% copper) consists of chalcopyrite hosted in quartz-magnetite ±K feldspar stockwork veins with local potassium feldspar alteration halos cutting equigranular granodiorite. Seven kilometres south of E39, at Milly Milly, clotted chalcopyrite replaces mafic phenocrysts overprinted by pervasive sericite alteration. Many of these porphyry systems have not been comprehensively investigated (Leslie et al., 2017). The E42 deposit is covered by 30 m of lake sediments and an underlying Tertiary laterite profile with no outcrop of the host volcanics, apart from some minor gossanous float. • Porphyritic Andesite which is plagioclase-phyric and coherent, with associated monomictic breccia facies. • Intrusive rocks - the lower sections of this volcano-sedimentary succession is intruded by a thick, locally up to 230 m, holocrystalline to euqigranular to porphyritic diorite sill complex (the 'Muddy Lake Diorite' of Miles and Brooker, 1998) and by multiple generations of dykes, with at least six different compositions. Of these, four are pre-gold, namely those with feldspathic, megacrystic, pyroxene-phyric and mafic compositions, while those that are vesicular and dioritic are post-mineral (Balind et al., 2017). These post-Muddy Lake Diorite dykes were emplaced in active faults which are 0.2 to 20 m thick (averaging 1 to 3 m). A few drill holes have passed through the Muddy Lake Diorite sill into fine to course volcaniclastic sedimentary rocks that may represent a unit lower in the succession than the Lower Volcaniclastic Unit. The Muddy Lake Diorite, which is one of the hosts to gold bearing veins, has been dated at 453±3.8 Ma (U-Pb; Perkins et al., 1995) and 456±5 Ma (K-Ar, hornblende; 1995; Bastrakov, 2000). A late stage diorite dyke within the NW-trending Wamboyne fault on the eastern margin of the Cowal pit is regarded as post-mineral only on the basis of its lack of both alteration and observed gold bearing veins (Henry et al., 2014). Dating of this dyke yielded an age of 448±4 Ma (U-Pb LA-ICP-MS from 23 zircons; Strickland 2005). Attempts to refine the date of this same dyke produced a scatter of ages from 447.2±8.4 to 465.5±7.3 Ma, with an inferred concordia age of 454.2±4.7 Ma (SHRIMPRG, 11 zircon cores and rims; Henry et al., 2014) and a weighted mean age of 455.6±4.1 Ma excluding one outlier (207Pb-corrected 206Pb/238U; 12 zircons; Henry et al., 2014). Many of these zircons were xenocrystic and hence the results may be problematic. An additional date of 450.5±1.3 Ma (TIMS 207Pb/235U, monazite; Henry et al., 2014) was regarded to reflect a more reliable crystallisation age of the late postmineral diorite dyke as the monazite did not have problems of inheritance or xenocryst incorporation encountered with the zircon sample. These dates constrain mineralisation to between 453±3.8 Ma and 450.5±1.3 Ma (Henry et al., 2014). Within the immediate Cowal deposit there are several generations of faults, some of which predate gold mineralisation, whilst others are post-mineral. There are two main sets that display metre scale offsets of bedding, although the direction and magnitudes of any slip component is not known. These structures range in thickness from <1 to ~15 m and contain gouge and breccia. The first and dominant set has a NW strike/dip of 322°/69°NE, while the second NNW-SSE trending set averages 155°/64°SW, with a dihedral angle of ~50°. The intersection of these sets has a near horizontal plunge of 15° and a NW azimuth of 328°. These orientations are interpreted to be consistent with an extensional stress field with a near-horizontal intersection of conjugate normal faults (Henry et al., 2014). This sub horizontal intersection and the fact that the faults cut a laterally extensive, uniformly dipping volcaniclastic sequence is interpreted to suggest the stratigraphy was already tilted shallowly NNW prior to normal fault formation (Henry et al., 2014). Most faults are pre-mineral, although the NW-trending (322°) faults were locally reactivated after gold mineralisation, disrupting the mineralised veins emplaced along them. In addition, two small populations of late-stage post-mineral brittle faults appear to predate significant reactivation of the NW-trending faults. The first of these are the young SE-dipping Nerang set of deposit scale reverse fault, which has cut most faults at the Cowal deposit. The final suite are bedding-parallel, with offsets of millimetre to tens of centimetres, interpreted to be a result of footwall shortening, accompanying thrust motion on the overlying Booberoi fault (Henry et al., 2014). • Pre-mineralisation assemblages which are usually only found distal to mineralisation and occurs as an incipient to strongly developed assemblage that includes quartz, albite, chlorite K feldspar ±epidote ±magnetite ± hematite ±carbonate (Balind et al., 2017). This assemblage is present in the Ordovician magmatic and volcaniclastic rocks as a broad background halo peripheral to structures. It is recognised by the weak to total albitisation of plagioclase and the replacement of mafic minerals by chlorite (McInnes et al., 1998). Within the upper volcaniclastic unit, it is characterised by spotty to pervasive chlorite-calcite ±sericite but is accompanied by epidote, magnetite and albite in the diorite sill (Miles and Brooker, 1998). It is overprinted by all other alteration assemblages and gold-bearing veins and is interpreted as the oldest and most regionally extensive alteration phase at the Cowal deposit. This alteration has been attributed to either emplacement of diorite and granodiorite intrusions in the Cowal Igneous Complex or to low-grade regional metamorphism (Miles and Brooker, 1998). i). Chlorite-carbonate-pyrite ±hematite ±leucoxene ±sericite ±K feldspar, which is texturally destructive, and distinguished by its cross-cutting nature and black chlorite, pyrite, carbonate and fine leucoxene grains. It is interpreted to represent a dynamic alteration phase that promoted demagnetisation of magnetic lithologies and the concurrent development of pyrite. This assemblage occurs in all rock types with the exception of postmineral dykes, and predominantly occurs as patchy to pervasive developments, irregular veinlets and clotty disseminations proximal to gold-bearing veins (Henry et al., 2014; Balind et al., 2017). ii). K feldspar-quartz is a weakly developed assemblage that is almost exclusively restricted to the trachyandesite (Miles and Brooker, 1998). It is characterised by irregular patches of pink-red K feldspar and grey quartz, with sporadically associated epidote, as well as occurring as rare millimetre-scale halos to gold-bearing veins. This alteration overprints the background pre-mineral assemblage, but its timing has not been constrained relative to the black chlorite-carbonate-pyrite and sericite-silica-carbonate alteration, as it is generally spatially distinct from the latter two. iii). Sericite-silica-carbonate (ankerite) -pyrite ±leucoxene ±albite ±chlorite ±illite is an overprinting phase associated with main stage mineralisation in all the gold deposits of the gold corridor (Balind et al., 2017; Henry et al., 2014). This alteration is texturally destructive, and is dominated by sericite and silica. It has further destroyed magnetic susceptibility and is characterised by pervasive bleaching. It occurs in all rocks except post-mineral dykes, and is best developed in the Upper Volcaniclastic Unit. Sericite-dominated alteration dominantly occurs as fine-grained, centimetre to metre scale halos to subvertical fault zones, quartz sulphide bearing veins, fault-hosted hydrothermal breccias, and intervals containing abundant ankerite veins that have reopened subvertical faults and veins. These halos typically grade outward into background chlorite-dominated assemblages. In contrast to steep structures, inclined veins have narrower alteration halos. The intensity of alteration decreases with depth where it is often fracture controlled, possibly a reflection of the decrease in permeability of the hosts compared to the Upper Volcaniclastic Unit, where it is more intense and pervasive (Henry et al., 2014). Sericite-silica alteration is also more intense and pervasive within a tabular plagioclase-phyric monzodiorite phase contained within the Muddy Lake Diorite at Cowal (Balind et al., 2017). There are limited observations that suggest that sericite-quartz-carbonate alteration has overprinted black chlorite-carbonate-pyrite alteration in the upper volcaniclastic unit, although Miles and Brooker (1998) interpreted the opposite paragenetic relationship (Henry et al., 2014). • Post-mineralisation alteration characterised by an assemblage of carbonate ±chlorite ±hematite which is a late stage overprint manifested as cross-cutting carbonate veins containing chlorite and/or being enclosed by hematite selvedges (Balind et al., 2017). ii). a steep suite striking ~121° and dipping 83°SW that are generally parallel to faults and dykes. The bulk of the gold mineralisation occurs in steep sheeted and shallow tensional and dilational vein sets, associated with coarse framboidal pyrite and base metal sulphides contained within the veins. Gold grades are correlated with higher vein density and the mode of occurence of sulphides in those veins. In addition pyrite, the principal sulphde species are sphalerite, chalcopyrite and lesser galena, tetrahedrite and tellurides. ii). Shear veins that are carbonate-rich with variable sulphide and irregular vein margins. These veins vary from shallow to steeply dipping, with inconsistent strike directions and thicknesses that range from 1 to >500 mm. iii). Quartz-sulphide breccia, which can contain bonanza gold grades associated with high sulphide content. Quartz sulphide breccia is considered to be of hydrothermal origin formed by implosive fragmentation within dilational sites along brittle faults. These breccias vary from 50 to over 500 cm in thickness and can pinch and swell along their generally limited lateral extent. Strike varies, although most breccia have a WNW to NW trend dip moderately to steep south or NE. i). Steep gold-bearing carbonate-base metal veins, interpreted to be the oldest syn-gold veins at E42. Prior to their development, the previously tilted Ordovician host sequence was subjected to brittle faulting, likely developed under tensional stress directed ~NE-SW, followed by emplacement of dykes along NW-trending faults and along a less dominant E-striking orientation. Two sets these steep veins followed fractures parallel to some of the fault and dyke populations. Although there is considerable variation, two main orientations are distinguished, 331°/73°NE and 069°/76°SE, which represent a near orthogonal relationship. Some of these veins follow the margins of pre-mineral dykes, whilst the abundance and frequency of gold-bearing veining at E42 decreases away from faults and dykes. Similar mineralogies are found in both vein sets comprising calcite-quartz-pyrite ±adularia ±sphalerite ±galena ±chalcopyrite ±covellite ±visible gold with or without late-stage ankerite void space infill. Minor pyrrhotite has been identified in pyrite, as well as rare telluride minerals (hessite, altaite and petzite) associated with pyrite, galena and gold (Bastrakov 2000). Pyrite within the veins has been extensively fractured, with carbonate, sphalerite and galena variably filling those fractures along with gold. Gold is also present as inclusions within pyrite, and is commonly spatially associated with sphalerite. Crosscutting relationships in reactivated veins and fractured pyrite grain textures provide evidence of multiple generations of carbonate-base metal vein opening events. The youngest vein infill is late stage ankerite, commonly filling void space around prismatic quartz crystals (Henry et al., 2014). Both of these steep carbonate-base metal vein sets can be traced for >2 m with thicknesses generally of 2 to 5 mm to as much as 10 cm in some banded veins. Adjoining vein segments typically overlap at their extremities and are linked by oblique subsidiary veins. Vein walls are planar to irregular. Some of the vein textures at the E42 deposit are regarded as typical of epithermal systems (Dong et al., 1995), including zoned crustiform quartz and feathery quartz. No crosscutting relationships have been observed between these two steeply dipping gold-bearing vein populations (Henry et al., 2014). Stage 1 - barren quartz → quartz-pyrite-sphalerite (±calcite ±chlorite ±late ankerite) → barren quartz or quartz-ankerite. Stage 3 - barren ankerite ±calcite ±chlorite. Clasts are typically rotated, and are generally angular to subangular with negligible milled clast material in the matrix. They are both monomictic to polymictic, including wall rock, mainly volcaniclastic rocks, as well as fragments of dykes and barren and mineralised veins. Most of these breccia zones follow dyke margins and pre-mineral faults that have been reactivated during gold deposition and subsequent events. They are laterally and vertically discontinuous on the scale of tens of centimetres to a few metres and are unpredictable in their distribution. Stage 1 breccias are steeply dipping and contain feldspar-phyric clasts, interpreted to be fragments of dykes that had been emplaced in older pre-mineral faults. Many of the gold-bearing breccia intervals of this stage are spatially related to the Western and Corringle faults cutting through the central sections of the Cowal/E42 deposit, and are also found directly above the Corringle fault. Each of these faults has undergone post-mineral reactivation and filled with cataclastic rocks, which include mineralised vein clasts. Gold bearing stage 2 breccias are locally reactivated stage 1 breccia faults, and dip steeply to moderately to the east and SE. Stage 3 breccias are not mineralised, and are contain clasts dominated by local volcaniclastic wall rock, some older vein clasts, and rare fragmented quartz-cemented breccias and dykes. They have locally overprinted quartz-cemented stage 1 breccias and commonly have euhedral ankerite crystal terminations in void spaces between clasts. These late-stage ankerite-cemented breccias occur along the NW trend of deposit-scale faults, and dip steeply to the east. Ankerite feeder veins to some of these ankerite-cemented breccia intervals locally crosscut inclined gold-bearing veins, indicating that the ankerite brecciation event was post-gold at E42 (Henry et al., 2014). iii). Inclined gold-bearing carbonate-base metal veins - The dominant gold-bearing veins of this type at E42 deposit are moderately SW dipping, with a much smaller population developed subparallel to slightly oblique to bedding. Average vein orientations are 101°/42°SW and 185°/39°W, respectively. Most have planar, parallel sides and massive infill. These inclined gold-bearing veins crosscut the older, steeply dipping auriferous vein populations with little to no offset of the latter, but in rare cases where it occurs, that offset is only a few mms and is normal. This offset suggests some increment of slip along the inclined vein either during or subsequent to its formation. The mineralogy of the two vein sets is identical, predominantly comprising quartz-calcite-pyrite ±adularia ±sphalerite ±galena ±chalcopyrite ±visible gold ±late-stage ankerite with minor pyrrhotite, hessite, petzite and altaite (Miles and Brooker, 1998; Bastrakov, 2000). Pyrite within the veins is commonly fractured and is variably enclosed by carbonate, sphalerite and galena, as well as gold. While the bulk of the inclined vein set obliquely crosscut bedding, a small population of roughly bedding-parallel planes of weakness were reopened to host gold-bearing veins. As with the older steep vein set, inclined veins include crustiform quartz crystals, some of which have zonal and feathery textures. Inclined veins can be traced on a metre scale, and vary from <1 to 150 mm, averaging 5 to 10 mm. Veins commonly overlap at their extremities, whilst some are hard-linked to the adjoining vein. A few thicker inclined veins are up to several cms across and have curviplanar traces on the pit wall. The thickness if some of these vary along the length of the vein, but retain a consistent geometry, Vein segments with shallower dip angles generally have slightly thicker widths, and conversely, steeper segments appear somewhat thinner (Henry et al., 2014). The transition from steep to inclined veining suggests that the local stress axes must have changed from sub-horizontal extension and subvertical compression during the emplacement of the early steep vein fill to near-vertical tension and horizontal extension during late inclined vein fill event. iii). three mutually crosscutting sets of late carbonate-chlorite ±hematite veins. The E41 gold deposit is a satellite of E42, located ~1 km to its south, on the eastern margin of the Muddy Lake Diorite sill. It has been divided into two higher grade mineralised domains, the E41 West and E41 East pods. The E41 East is lithologically complex, hosted in clastic and intrusive facies, whilst the West Pod mineralisation is primarily within a mafic monzonite intrusion. The pods are ~300 m apart, separated by the NW-trending and E-dipping Cowal fault which includes post-mineralisation displacement (Zukowski et al., 2014). The volcanosedimentary sequence at E41 East is predominantly shallowly NW-dipping, laminated to locally massive, mudstones, with intercalated >1 to 40 m thick beds of coarse polymictic volcanic breccia and volcanic sandstone. These rocks are intruded by sills and numerous dykes. The volcanic facies distribution in the Cowal district has been interpreted to indicate the sequence at E42 and E46 was deposited proximal to a submarine volcanic centre, whilst at E41, the host rocks were deposited in a quiescent deepwater environment, distal to the main volcanic activity, with episodic mass flows of volcanically derived deposits (Miles and Brooker, 1998; J. Cannell, pers. commun., 2005; K. Simpson and D. Cooke, pers. commun., 2006, reported by Zukowski et al., 2014). Pre-mineral Intrusions - which are predominantly mafic to intermediate in composition, typically clinopyroxene (diopside) and plagioclase bearing, with subordinate hornblende and accessory biotite, apatite, titanite and magnetite. These include the Muddy Lake Diorite sill, which is up to 240 m thick, followed by plagioclase-phyric, trachyte and mafic dykes of dioritic composition, then mafic-monzonite to monzodiorite dykes. The Muddy Lake Diorite is spatially associated with mineralisation at E41 East. It, and the volcanosedimentatry sequence, are cut by the pre-mineral dykes, which are controlled by NE-trending and steeply SE to S dipping faults. E41 West mineralisation is hosted by a 300 m diameter medium-grained mafic monzonite stock, which has a vertical extent of >500 m, and intrudes both the volcanosedimentary succession and Muddy Lake Diorite sill. This stock is reflected by a circular magnetic low within the highly magnetic diorite sill. The stock is interpreted to have been volatile saturated during crystallisation by the presence of and potentially contributed to miarolitic cavities, and was potentially coeval with the mineralisation. It includes a hybrid zone of black, fine-grained monzodiorite and/or enclaves of a megacrystic plagioclase-phyric rock, suggesting magma mixing. This hybrid zone has a width of >50 m in the centre of the mafic monzonite intrusion, expanding to the south, with a vertical extent of >100 m.
A second, smaller mafic monzonite intrusion is located below the E41 East deposit, and this is also a focus of alteration, as described below. Syn-mineral Intrusions - which include thin, <2 to 10 cm thick 'dykelets' of quartz-, K feldspar- and hornblende-bearing quartz monzonite and aplite, and thicker pyroxene-phyric dykes, which are distributed throughout E41. Some of the 'dykelets' contain gold-bearing clots of pyrite. Pyroxene-phyric dykes, which locally contains minor gold-bearing pyrite disseminations, are observed to crosscut quartz-pyrite veining and K feldspar-epidote alteration, but are, in turn, cut by carbonate-base metal sulphide veining. Late-mineral Intrusions - which include a syenite dykelet and a hornblende-phyric quartz diorite dyke which contain minor pyrite disseminations and weakly mineralized, <1 mm thick pyrite veinlets. Post-mineral Intrusions, which are exclusively mafic in composition, and are plagioclase bearing, including a hornblende-phyric dyke, plagioclase-phyric diorite dykes, and an amygdaloidal dyke, none of which contain gold-bearing veins or syn-mineralization alteration assemblages. On the basis of limited structural measurements, there appears to be two principal sets of faults and mineralised veins at E41, an early, steeply dipping, NNE to NE trending set, and subsequent, east striking, shallowly south to SE dipping faults and veins. The former is interpreted to be the shallow expression of a deeper-seated crustal weaknesses localised on the southern edge of the mafic monzonite stock at E41 West. Aplite and quartz monzonite dykelets have been localised by these same structures at E41 East and may reflect another deeper seated intrusion (Zukowski et al., 2014). The main hypogene gold mineralisation at E41 East is localised along the east-west contact between the volcanosedimentary units and the underlying diorite sill forming a 250 m wide and 200 m thick zone, whilst other smaller domains of mineralisation are randomly distributed throughout the mineralised pod. Supergene gold is developed in the weathering profile above the hypogene zone in the weathering profile which is up to 120 m thick (Zukowski et al., 2014). At E41 West, there are two major zones and several minor domains of hypogene gold mineralisation defined within the mafic monzonite stock, all of which strike north to NNE and dip ~60°E. Supergene gold mineralisation occurs to within 10 m below the present-day surface in an oxidised profile that is <80 m thick (Zukowski et al., 2014). Early-stage veins and alteration, which began with hydrothermal magnetite ±biotite alteration in the mudstones, sandstones and volcanic breccias at E41 East, at locations between the two pods, and to the south of E41 East. This alteration occurred as a stage 1 actinolite-magnetite assemblage within the Muddy Lake Diorite sill at E41 East, whilst two equivalent suites, stage 1A, ≤1 to 30 mm thick magnetite veins and veinlets and subordinate 2 to 5 mm stage 1B quartz-magnetite veins are found in the other rocks. Rare stage 2 andradite-bearing veinlets are found close to the mineralised centre of E41 East, restricted to the volcaniclastic sandstones and breccias. Stage 1 veining at E41 West occurs as 2 to 10 mm vein-dykes of myrmekitic quartz-K feldspar ±actinolite ±pyrite, whilst stage 2 veining is ≤1 to 5 mm thick quartz-carbonate with illite ±ankerite. The stage 1 and 2 veins are overprinted by selective, 'patchy', pervasive K feldspar ±albite alteration which is widely distributed throughout the Muddy Lake Diorite at E41 East. The same alteration occurs near the mafic monzonite contact at depth below E41 East and extends laterally from the monzonite contact for at least 400 m eastward. It has also been observed forming a thin aureole around the mafic monzonite, which has internally been overprinted throughout by a selective, pervasive chlorite-albite ±K feldspar assemblage. K feldspar ±albite alteration is associated, but not exclusively, with a distinctive hematite dusting/reddening. At E41 East, this reddening is sporadically distributed, but intensifies around the mafic monzonite intrusion, defining a distinctive alteration halo. Several irregular zones of hematite alteration also characterise early stage veining and alteration in the E41 West mafic monzonite stock. Stage 3, the first of these, comprises mineralised quartz-pyrite veins and veinlets with minor carbonate and chlorite, subdivided on the basis of alteration halos into stage 3A-a, which is typified by distinctive epidote alteration halos; and stage 3A-b, with epidote-K feldspar selvedges. 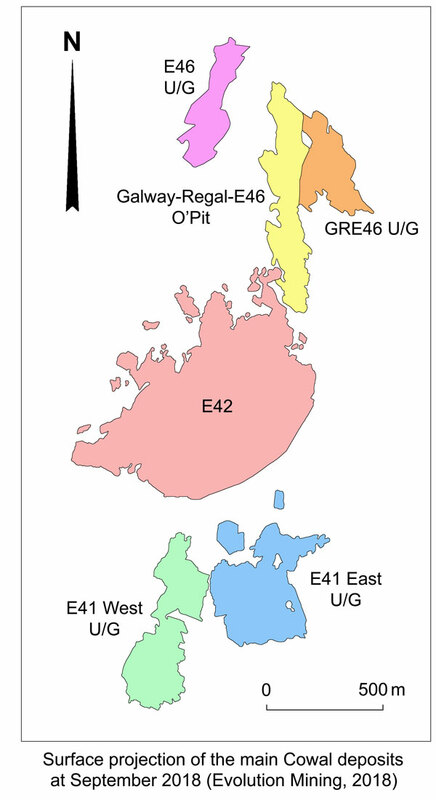 Both stages 3A-a and 3A-b are associated with steeply dipping, north and NE-striking fractures and are common in E41 East, but are rare in E41 West. Main-stage K feldspar-epidote alteration surrounds the southern portion of the mafic monzonite stock at E41 West, and also at depth within the Muddy Lake diorite sill surrounding the mafic monzonite below E41 East. Both epidote and K feldspar-epidote alteration, although associated with poorly mineralised veins, fringe fractures that were followed by later mineralising fluids. Stage 3A-c comprises pyrite-quartz veins that have illite-muscovite ±chlorite ±carbonate selvedges. These veins are 5 to 100 mm thick at E41 East and 2 to 10 m at E41 West, and are predominately E trending, dipping shallowly to the S to SE, cutting steeply dipping stage 3A-a and 3A-b veins. Stages 3A -a to c veins generally carry <1 g/t Au at E41 East and West. Stage 3B occurs as 2 to 50 mm thick quartz-pyrite-adularia veins at E41 East and are morphologically similar to stage 3A-c with which they have mutual crosscutting and overprinting relationships (Cooke and Bloom, 1990), indicating that they formed essentially at the same time. They assay ~3 g/t Au. This stage is virtually absent at E41 West. Stage 4 is the second mineralising event at E41, and is characterised by base metal sulphide and telluride-bearing carbonate-base metal sulphide veins. Stage 4A crosscut and/or reopen and infill stage 3 veins at both E41 East and West. They vary from ≤1 to 10 mm thick, and at E41 East may reach 50 mm, and carry abundant carbonate species (calcite, ankerite), quartz, chlorite, illite-muscovite and sulphides ±hematite ±apatite. Sulphides include pyrite, sphalerite, galena, chalcopyrite, tetrahedrite and Ag-Au and Bi tellurides. Gold grains, averaging 40 µm in across occur as inclusions in sphalerite and are associated with Ag tellurides and/or with chalcopyrite crystals. Some strongly mineralized stage 4A veins (e.g., Au >30 g/t) contain apatite crystals enriched in rare earth element (La, Ce, Nd and Sm) that are intergrown with muscovite, chlorite, hematite and calcite. Stage 4B, which largely absent from E41 West, consists of arsenopyrite-ankerite ±pyrite ±Bi tellurides. This veining largely takes the form of infilling of re-opened veins, particularly those of stage 4A, but is seen to cut preexisting stage 4A sulphide bands and associated illite and carbonate-bearing veins and alteration halos. Stage 4C veins are typically associated with the highest grade gold mineralisation at E41, and are irregular, multistage veins that are typically brecciated and fault related, occupying steeply dipping faults and veins, occurring as 'quartz-sulphide breccia'. They are reasonably common at E41 East, but are only sporadically developed at E41 West. Stage 4C veins are commonly brecciated, occupying steeply dipping faults and veins. Many have reactivated stage 3A-a and 3A-b veins. NE to east trending, steeply SE to south dipping stage 3 veins are the most likely site for development of stage 4C veins. Stages 3B to 4C veins average 3 to 5.5 g/t Au with several hundred to >1000 ppm Cu. Alteration during the Main stage progresses from epidote to epidote-K feldspar with hematite dusting associated with stages 3A-a and 3A-b quartz-pyrite veining respectively, to an illite-muscovite-carbonate ±K feldspar ±chlorite ±pyrite alteration assemblage defining the alteration halos surrounding quartz-pyrite veins of stage 3A-c, to quartz-pyrite-adularia and carbonate-base metal sulphide veins and breccias of stages 4A to C.
Late-stage veins and alteration, characterised by veins containing gypsum, epidote and hematite, with abundant calcite and ankerite. These veins, which constitute stage 5 carbonate-quartz ±hematite/specularite with weak illite halos; stage 6 epidate-carbonate-pyrite; and stage 7 ankerite veins are typically irregular to wispy, while some occur in erratic networks that have completely obscured the original rock textures. Gold is absent from these late stage veins. Late-stage alteration comprises epidote, hematite-calcite and pervasive fault-related clay and mica-bearing mineral assemblages. Epidote forms as weak replacement of plagioclase crystals and groundmass in some post-mineralization dykes (i.e., late 'diorite' and hornblende-phyric dykes). Hematite-calcite has altered the post-mineralisation amygdaloidal dyke. Ankerite, together with other carbonates occur as a late alteration overprint at E41. Weak selective pervasive to locally pervasive illite-muscovite, chlorite and carbonate alteration is found in all post-mineralisation dykes. Fluid inclusion data and stable isotope analyses are interpreted to provide evidence that the mineralising fluids had a magmatic-hydrothermal component, and that gold precipitated from boiling saline waters with ~9.0 wt.% NaClequiv. at temperatures of ~310°C (Zukowski et al., 2014). Stage 4 illite formed at temperatures below ~280°C. Stage 3 veins are estimated to have formed at a depth of ~1 km below palaeosurface at a hydrostatic pressure of ~90 bars. Stage 3 calcite has δ13Ccalcite and δ18Ocalcite values that range from -5.2 to -4.6 and from 11.6 to 12.1‰, respectively. Calculated fluids for these mineral values at 300°C (δ13Cfluid = -3‰; δ18Ofluid = 6‰) are regarded as consistent with a magmatic-hydrothermal source of carbon and oxygen during stage 3 (Zukowski et al., 2014). Stage 4 is inferred to have had a component of meteoric water, based on δ13Ccarbonate and δ18Ocarbonate values range from -6.9 to -0.5 and from 10.9 to 30.1‰ respectively, corresponding to δ13Cfluid and δ18Ofluid values of -5 and -2‰ at 200 to 250°C. Early vein stages have δ34Ssulphide values ranging from -4.9 to -0.5‰, whilst values for stage 3 range from –5.2 to +0.8‰ with the most 34S enriched samples deposited distal from the mineralised centre. For stage 4, these values are between –7.5 and 2.5‰. The negative isotopic values are consistent with oxidised, predominantly sulphate, magmatic-hydrothermal fluids (Zukowski et al., 2014). Zonation patterns of sulphur isotopes indicate the most negative δ34S values correspond to gold-enriched domains, and also with areas containing high-temperature, porphyry-style alteration facies. Negative sulphur isotope values are interpreted to define zones of upflow of the mineralising magmatic-hydrothermal fluids. The paragenetic history ar E41 demonstrates a transition from deep- to shallow-level magmatic-hydrothermal activity, which implies synchronous uplift, erosion and unroofing of the system, and telescoping of mineralisation and alteration patterns from progressively shallower depths. High-temperature assemblages (e.g., actinolite-magnetite, biotite and K feldspar-epidote) imply epithermal mineralisation occurred proximal to a magmatic-hydrothermal centre, possibly overlying a porphyry copper-gold system at depth (Zukowski et al., 2014). In their discussion of the origin of these deposits, Balind et al. (2017) observed that the Cowal gold corridor deposits include ore-bearing hydrothermal breccia with chalcedonic silica, which is consistent with a high crustal level of emplacement. They also noted the deposits of the gold corridor have many characteristics common to orogenic gold systems, including: i). a strike-slip convergent tectonic environment; ii). the occurrence of first, second and third order faults; iii). the presence of lamprophyre dykes; iv). mineralisation and alteration styles seen in orogenic deposits; v). absence of mineral zonation at a deposit scale; and vi). zones of geologically complex rheological contrasts. However, while no single intrusive body can be directly linked to the gold mineralisation, geochronological data suggests a close temporal and spatial association with intrusive-related porphyry Cu and Cu-Au mineralisation, particularly at E41 (Corbett and Leach, 1998; Zukowski et al., 2014). The occurrence of hematite, magnetite and negative 34S isotope values of pyrite suggest oxidised, magmatic-hydrothermal fluids were involved in the gold corridor mineralisation and the association of a base metal component are all atypical of most orogenic~gold deposits. The presence of anomalous Bi and tellurides also strongly imply a magmatic involvement. Balind et al. (2017) therefore interpret the Cowal gold deposit to be a cluster of structurally controlled, low to intermediate sulphidation epithermal, quartz-carbonate-base metal-gold deposits. Mineral resources - 47.53 Mt @ 1.04 g/t Au, for 49 t of contained Au. Mining commenced in mid 2006. Total production to the end of 2010 was ~34.75 t Au. Mineral resources - 48.3 Mt @ 0.98 g/t Au, for 47 t of contained Au (in addition to reserves). Production during calender year 2010 totalled 9.27 t of recovered Au. Inferred Resource - 5.27 Mt @ 1.5 g/t Au, for 8 t of contained Au. TOTAL Resource - 193.9 Mt @ 0.88 g/t Au, for 170 t of contained Au. Inferred Resource - 5.9 Mt @ 3.17 g/t Au, for 18.75 t of contained Au - at a 3 g/t Au cut-off. GRE46 underground resource, down dip to the east of the open pit resource - 18.8 t Au. Production during calender year 2018 totalled 8.025 t of recovered Au. Total production to the end of 2018 was ~110 t Au. Balind, P.R., Booth, J. and McInnes, P., 2017 - Cowal gold deposits, Lake Cowal: in Phillips, G.N., 2017 Australian Ore Deposits, The Australasian Institute of Mining and Metallurgy, Mono 32, pp. 775-778. 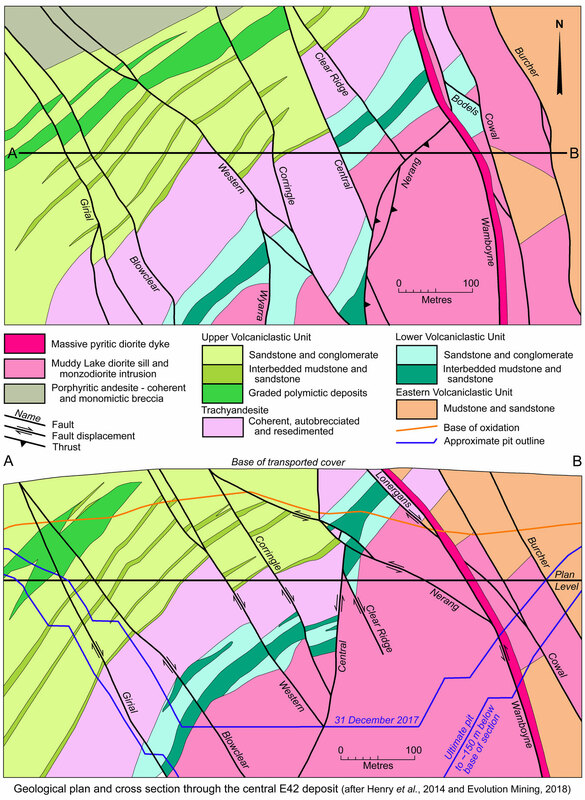 Henry, A.D., McInnes, P. and Tosdal, R.M., 2014 - Structural Evolution of Auriferous Veins at the Endeavour 42 Gold Deposit, Cowal Mining District, NSW, Australia : in Econ. Geol. v.109 pp. 1051-1077. Leslie, C., Balind, P., Howard, N. and Heidemann, G., 2017 - Cowal Gold Mine; district geology and exploration overview: in Discoveries in the Tasmanides, 2017, AIG Bulletin, 67 4p. McInnes, P. and Freer, L., 2007 - The Cowal Gold Corridor - Opening other doors: in Mines and Wines, 2007, Mineral Exploration in the Tasmanides AIG Bull. v.46, pp. 95-100. Miles, I.N. 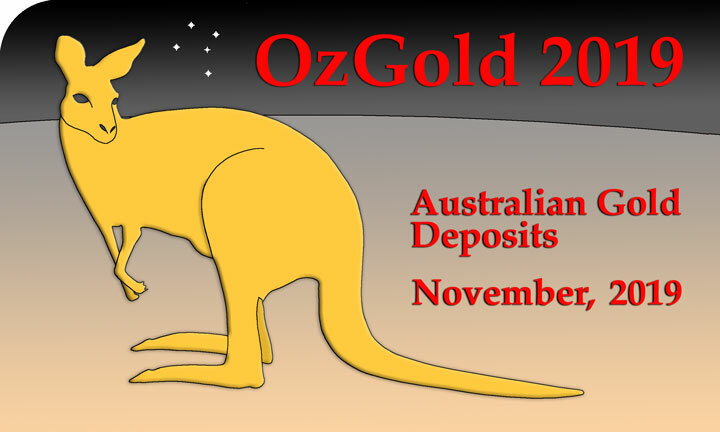 and Brooker, M.R., 1998 - Endeavour 42 deposit, Lake Cowal, New South Wales: A structurally controlled gold deposit: in Australian J. of Earth Sciences v.45, pp. 837-847. 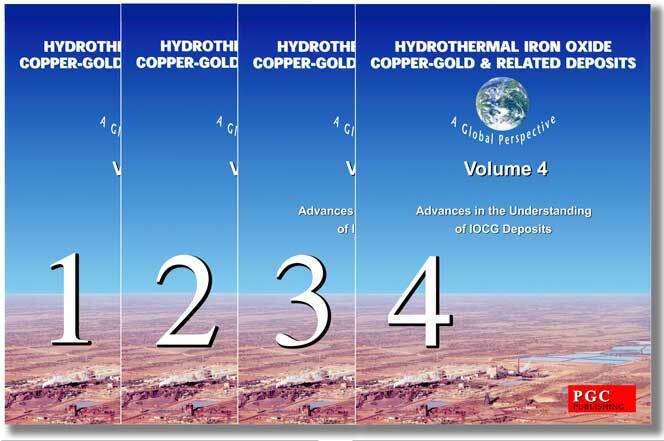 Zukowski, W., Cooke, D.R., Deyel,l C.L., McInnes, P. and Simpson, K., 2014 - Genesis and Exploration Implications of Epithermal Gold Mineralization and Porphyry-Style Alteration at the Endeavour 41 Prospect, Cowal District, New South Wales, Australia: in Econ. Geol. v.109, pp. 1079-1115.